You will need a room at least 40 feet long for this game, and ideally 9-10 children. This activity is scalable – you could do it outside at a distance of 40 meters or yards instead, or at any measurement, really – you’ll just need to recalculate the measurements included in these instructions. Print the planet images or create the name cards for each planet mentioned under “Suggested Materials” (see list of planets under “Make it Matter”). Tape the image of the Sun (or the printed word “Sun”) on one wall of the room you are in. If you are outside, tape to any appropriate object, or even place on the ground. Place the photo of Pluto 40 feet away (or farther, if you are changing the scale), on the ground or taped to a wall. Create a 40’ measuring line on the floor with masking tape or string, and mark 1-foot lines along its length, starting at Pluto and ending at the Sun. This will make measurement during the activity much easier for you. NOTE: For an indoor, and smaller-scale (though slightly more involved) version of this activity, try the Astro Map activity from this curriculum (click here). Printed Solar System images from NASA Inspirations (click here) of the Sun, each of the major planets, and Pluto and Ceres (the two largest dwarf planets), or 11 sheets of paper, each with a name of the Sun or a planet, large enough for people to read across the room. A sesame seed or grain of rice. Can they place these objects in order? Help them create a list in the correct order (above), and write this list down in a visible spot. How far apart do they think these objects might be? Show your students the NASA images of some of these objects included with this curriculum. You can print them out or show them the images on a computer. You can also visit NASA’s amazing solar system website, which is full of images, information and more: http://solarsystem.nasa.gov/planets. Play this game by predicting how far apart the major objects in our solar system are! Point out the “Sun” and “Pluto” signs you put up, and tell your students that you have created a scale model of the solar system, but you need help filling in the rest of the planets. Tell the group that you’d like to play a game where they predict how far apart the planets in our solar system are. For a sense of scale, pass around a sesame seed or grain of rice, and tell students that it represents the size of the Sun in the solar system model you have created. NOTE: A sesame seed is about 3mm wide; a grain of rice is slightly thicker than that. If you scale this activity up (to 40 yards, for instance) your sample object will have to change as well. See “Suggestions” for scaling ideas. Ask the group to gather at Pluto. 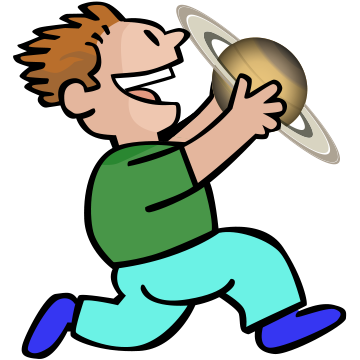 Refer to your list of planets and dwarf planets, and ask your students which planet is next closest to the Sun, after Pluto (Neptune). Ask the group to walk toward the Sun, and for each child to stop walking and stand where they think Neptune would be located in this scale solar system model. Hand the student closest to 9’ from Pluto the Neptune sign, and ask them to stay there and be Neptune (if you have fewer than 9 students, you can simply place the planet signs at each stop and all continue on together). Have the rest of the group walk and predict where the next planet, Uranus, would be (20’ from Pluto). 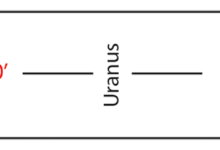 Give the closest student the Uranus sign, and have them stay there. Continue in this manner with the remaining planets. When you reach Ceres…things start to get a little tight! You’ll need to break out the measuring tape to start measuring inches, and you’ll likely have to just choose a student for each planet, as your students will all be in around the same area. And see Figure 1 in Resources, above, for an overhead view of the distances. Ask your students if they were surprised by the results. It is worth reinforcing the vast distances between objects in our solar system – while it may look like they are close together, based on this activity, our solar system is a truly enormous place. Ask your students how long they think it might take to drive in a car, at 60 miles per hour, from Earth to Mars (using the average distance between the two). Write everyone’s guesses down on a piece of chart paper, dry erase board, etc. Did anyone come close? Reveal the answer: Traveling from Earth to Mars at 60 mph would take 92 years (it’s 48,500,000 miles)! What do they think is in all that space between the planets/other objects (hint – we call it “space” for a reason…)? There is not a lot out there in space. The majority of the universe is wide-open and empty. If you’d like to continue on past our solar system, you can ask your students to predict how far away, in the 40-foot model you created, the next closest star would be to our solar system (our closest star is, of course, the Sun). The closest star outside our solar system is called Proxima Centauri, and it is about 4.2 light years away – that’s almost 25 TRILLION miles. This is a distance that’s pretty much impossible to imagine. At 60 miles per hour, it would take over 47 million years to drive there. And in our 40-foot solar system model, Proxima Centauri would be 271,000 feet, or 51 miles away. Look on a map at how far 51 miles is from where you are. 40-yard scale – the AU numbers in the chart above equal how many yards each object is from the Sun in a 40-yard model. You could also measure in feet by multiplying the AU numbers in the chart above by 3. For example, Mercury, your new first stop, would now be 1.17 feet (.39 yards) from the Sun, instead of around 5 inches, as it was in the 40-foot model. Pluto is 118 feet (39.4 yards) away from the Sun. Your example “Sun”, showing a sense of scale, should be something about 9mm in diameter, or a little less than 3/8 of an inch…about the size of an un-popped popcorn kernel. 100-yard scale – stick with yards, and multiply all AU numbers in the chart above by 2.5. For example, Mercury, your new first stop, would now be .975 yards from the Sun (you can round up to 1 yard), instead of around 5 inches, as it was in the 40-foot model. Pluto is 98.5 yards away from the Sun in this model. Your example “Sun”, showing a sense of scale, should be something about 23mm in diameter, or slightly less than one inch…about the size of a quarter. For an indoor, and smaller-scale (and slightly more involved) version of this activity, try Astro Map from this curriculum (click here). You could make similar relative distance maps of cities in the U.S., countries, streets in your town, etc.